Hey you! And Happy New Year too! I hope you’re off to a great start. These first few weeks of the year are usually filled up with inspiration for new beginnings and healthy lifestyle changes. And so it seems to be this year too and I find myself kind of liking it and finding things that are actually useful. So far I’ve been reading about Easy Peasy Detox, found tips on how to save money and wake up earlier and found ways how to make yourself feel healthier. I’m not the one to do a detox but saving money, waking up earlier and just generally practicing more self-care have got me interested and I warmly welcome all inspiration in those areas. One of my personal goals for this year is to come up with creative and tasty vegetarian meals, and inspire you to try them too. I’m thinking about new ways (or at least new to me) to use tofu, tempeh and lentils and all kinds of veggie dips are always on my mind. 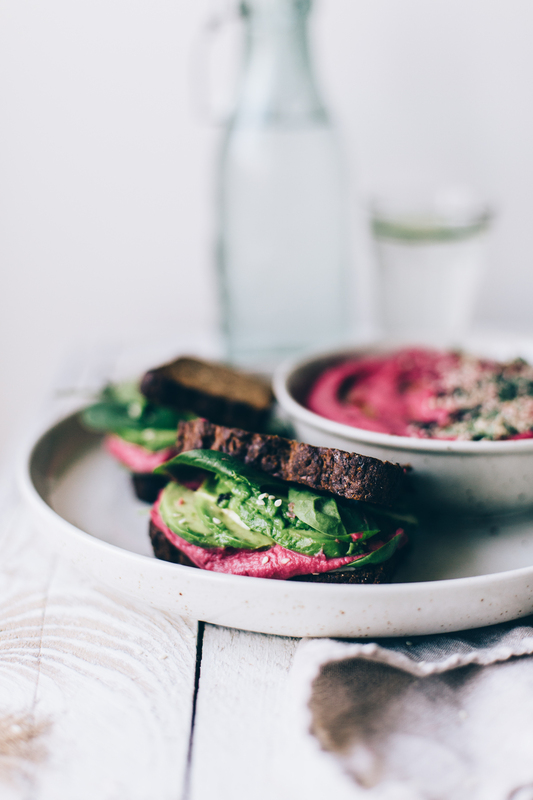 So when I got the new Vegemania cookbook by Manuela Bosco, I naturally had to try the beetroot hummus. 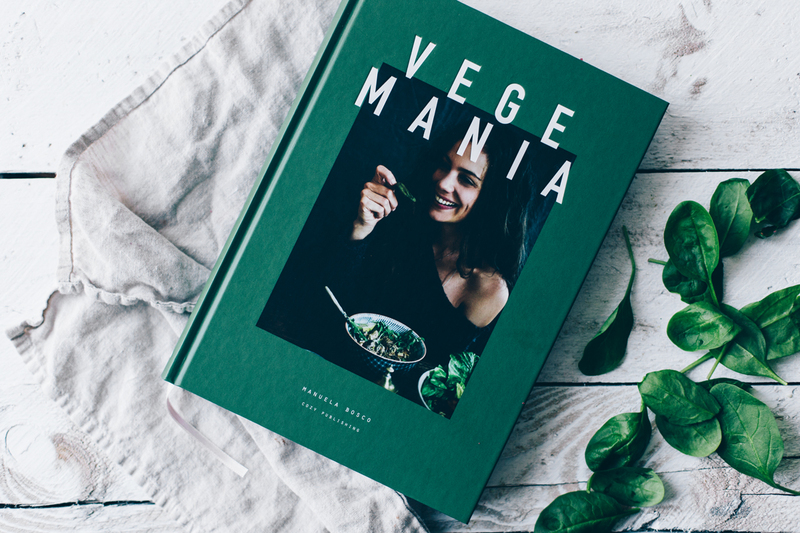 The book is entirely vegan and has lots of inspirational dishes, plus some interesting information about the vegan diet, which I found very useful too. The pancakes I tried were delicious and I definitely plan on trying the baobab mayo and the different pastas. The book uses beetroot hummus as a filling for super veggie sandwiches so I decided to do the same. The original recipe had lots of different kinds of fillings but I simplified things a bit and went with the ones I could find from the fridge. 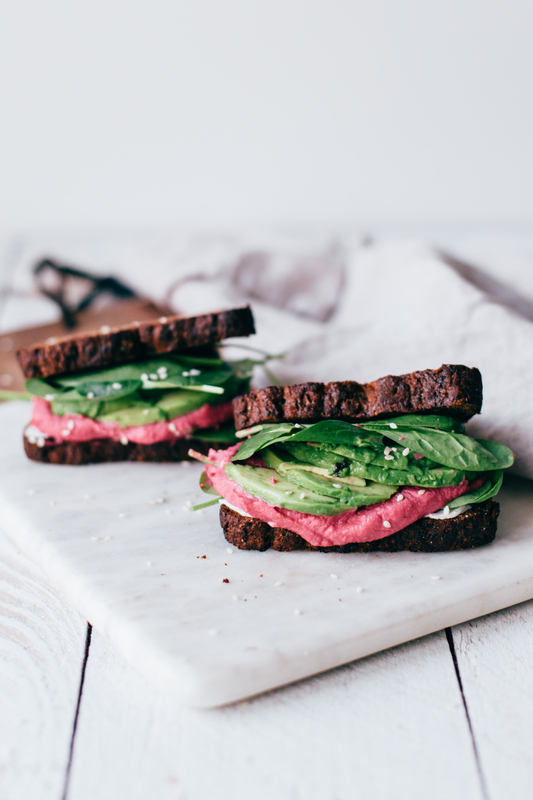 Lucky for me, it turned out that vegan cream cheese and avocado are a match made in heaven with the beetroot hummus. 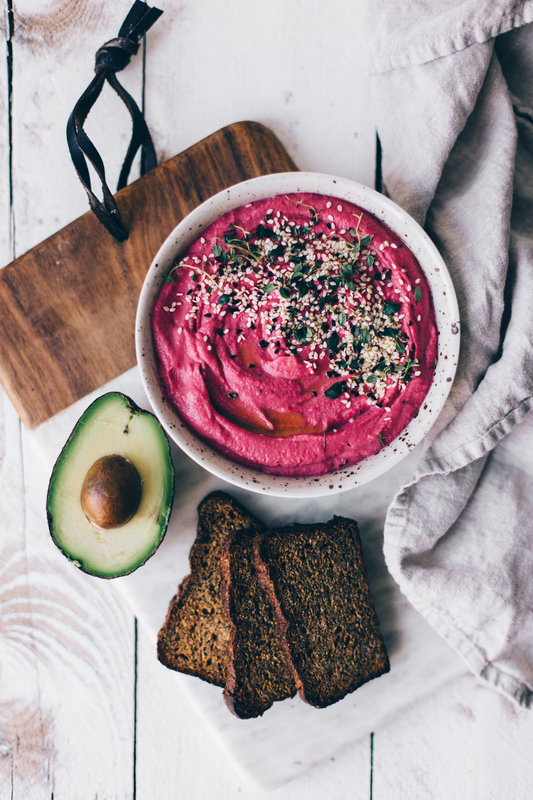 And besides on top of bread, the beetroot hummus is great in wraps, salads and all kinds of veggie bowls, especially if you love hummus like me. To get this year started with lots of plant-based inspiration I’m giving away a copy of the book! Just leave a comment and tell me what kind of recipes you’d love to see here on the blog (breakfasts, mains, snacks) and you’re in for the giveaway. The giveaway ends on Monday the 16th of January and is open for people living in Finland only. Toast the bread. 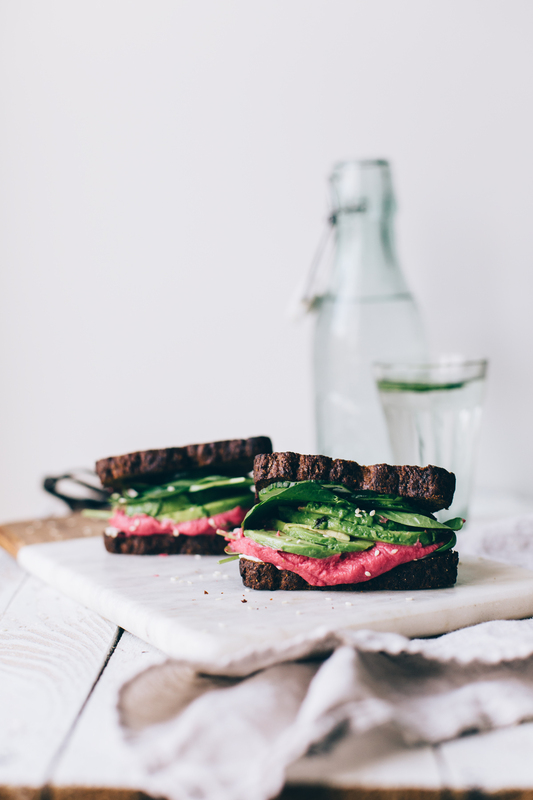 Spread a generous amount of the cream cheese and beetroot hummus on two slices of the bread. Top with sliced avocado, baby spinach and cucumber and the remaining slice of bread. Serve and enjoy! Open the can of chickpeas and rinse and drain them well. Add all ingredients to a high-speed blender and blend until smooth. Add water as needed to achieve a desired consistency. Store in an airtight container in the fridge for up to 4 days. Tagged breakfast, dips, nut free, sandwich, vegan, vegetarian. Sweet Potato Crostini w/ Cheese, Pear & Thyme is the perfect fancy and healthy snack or appetizer to your holiday parties! This Moroccan Chickpea Salad is a lovely mix of savory and sweet flavors, and it's topped with turmeric spiced seeds and a delicious tahini sauce. healthy and nutritious brekkie ideas are always appreciated! It’s too easy to eat always the same bowl of overnight oats so I’m needing some inspiration for easy yet delicious brekkies ! Thanks in advance! Nopeeta välipalaa, jota vois ennen treenejä popsia! Varsinkin suolaiset, terveelliset välipalat ois ihan parhautta! :) Sellaiset, joita voi tarpeen mukaan helposti tuunailla. Kekseliäitä tapoja piristää perusaterioita ja tuttuja raaka-aineita! Aamiainen on nykyisin hyvin edustettuna resepteissä. Olisi kiva saada ideoita myös ‘tuhdimpiin’ päivällisiin! Kekseliäitä ideoita ‘tuhdimpiin ‘ päivällisiin ja alku-pää-jälkiruokakokonaisuuksiin! Kaipaan lisää inspiraatiota arkisiin mutta herkullisiin pääruokiin :) etenkin nyt talvella tekee mieli jotain lämmittävää ja täyttävää vegaanista lohturuokaa. What a delicious sounding recipe! Going for a test immediately :) i love love love your blog and your recipes..! What I would love to see even more, would be easy and healthy everyday dinners, to get inspired to do something delicious and healthy even during the busiest of days! I would love easy and a bit different main meal ideas and sometimes breakfasts :) Savoury more than sweet! Jotain helppoja välipaloja, joita on kätevä kuljettaa koko päivän mukana. Myös pääruokiin kaipaan inspiraatiota! Aamiaisia, välipaloja, lounaita,… Kaikki ihanat uudet kasvisreseptit ovat tervetulleita! All of them! But if I have to choose, mains would be most needed at the moment. Kaikki aamupalareseptit ovat aina tervettulleita! Etenkin erilaiset tuorepuuroideat olisivat kivoja. More plant based and gluten-free breakfast and snack idea’s! Oh, that looks s o delicious! I would like to read and see a lot of dairy – and wheat-free veggie receipts. I’m at elimination diet ’cause my bad atopic skin and can’t eat almost nothing atm. But something easy, changeble options would cheer up my hard(ish) journey! Greetings! Would love some hearty brunch ideas that are easy to make also for a large group. ohhh that is a big question! I love healthy inspiration for everyday nourishing meals.. so I love almost every single post you post! Oh thanks so much! <3 And everyday nourishing meals are definitely coming up! This hummus is so vibrant and you’ve made it look so appetizing! Our Trader Joe’s here in the US has a beet hummus but I’ve never tried to make my own. I think I might just have to give this recipe a go! I love you site and I am planning on being a regular for now on! Suolaiset aamu- & iltapalat kiinnostaa!